Apple cider vinegar is one of those tonics that seems able to help with every ailment and indeed bloating and gas are no different. Digestive problems can leave us feeling slow and lethargic and in severe cases can cause serious health issues. So what causes bloating and how can we stop it? What we eat and how we eat it both play a major role in this issue. Processed foods, in particular those containing high levels of things like corn syrup, are known to cause serious disruption to the digestive system. Stress is also known to be a contributing factor with high levels of stress often said to contribute the formation of stomach ulcers. Apple cider vinegar can help your body to digest food in a number of ways. The pectin found in apple cider vinegar works as a prebiotic by encouraging the growth of good bacteria in the gut. Good bacteria including 'lactobacillus' help to break down food, absorb nutrients and fight off "unfriendly" organisms that might cause diseases. Apple cider vinegar also contains digestive enzymes that help our stomachs to produce more hydrochloric acid (the substance it uses to break down the food we eat.) This is very beneficial for people suffering from indigestion and reflux alike. As well as these great benefits, apple cider vinegar also contains a large array of vitamins and trace minerals, all of which are important for healthy living. Shot - A simple shot of neat apple cider vinegar once a day is an extremely simple yet effective way of including it into your diet. Sip all day - Another option is making a bottle diluted with water that can be sipped before each meal. This is a great method for people suffering from digestion problems. For this mixture add around 5 tablespoons of raw apple cider vinegar to a 16 ounce bottle of water and you are good to go. Warm morning drink - The last option we are going to look into is a warm morning drink that will help to kick-start your day. Simply heat some water before adding honey and apple cider vinegar. This helps to kick-start the metabolism and is a great way to get your digestive system working first thing in the morning. Other natural remedies for bloating. Bicarbonate Soda - Another alternative treatment to relieve gas or bloating is through the use of Bicarbonate Soda. For quick relief, simply drink 1/4 - 1 tsp of baking soda dissolved in a small glass of warm water. Lemon juice - Drinking lemon juice mixed with water is known to help settle upset stomachs as well as aid digestion. Why not try starting your day with a glass of this refreshing drink? Probiotics - Probiotics can be taken to increase the numbers of healthy gut bacteria found throughout the digestive tract. This can be done by taking supplements or eating foods like live yogurt. 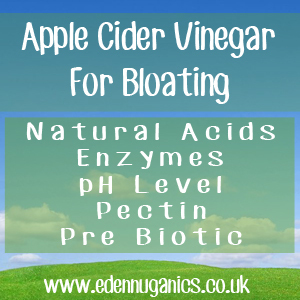 apple cider vinegar to relieve stomach bloating?